Took advance beauty course at Eemos beauty academy in Tirupati. I am so glad that I did it. I learned so much about the advanced beauty tips as well as the business strategies. They have a passion for what they are doing, and I would recommend the course to everyone. Advance Beauty Course, Sullurpet, SPSR Nellore District. 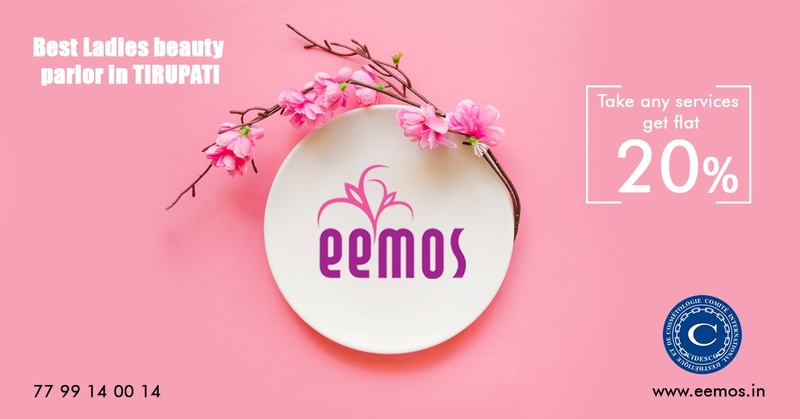 I joined in Eemos beauty academy for professional beauty course. My friend recommended it to me. The academy is truly fantastic and the tutor, Mrs. Mohana Lakshmi did cosmetologist training in the USA and has research experience in the industry. I loved her teaching. I recommend Eemos beauty academy. The Eemos beauty academy is astounding. The academy is pretty well and has experienced beauticians. I joined here for professional beauty course, and I loved their passion for helping the upcoming beauticians to excel in their career. I recommend Eemos for professional beauty course in Tirupati. Advance Beauty Course, Tirupati, Chittoor District. I completed my professional beauty course at Eemos beauty academy in Tirupati. The staff are knowledgeable, approachable, and also good listeners. They explained all my doubts with so much patience and helped me build confidence. I took one of the best decisions of my life by choosing Eemos for my beautician course in Tirupati. I loved attending classes at Eemos, and they have years of experience in the teaching industry. They explained all the possible career opportunities in the beauty industry and trained me according to my passion for starting my own business. Advance Beauty Course, Railway Kodur, Kadapa District. I recently completed hairdressing course at Eemos beauty academy in Tirupati. The was amazing with great tutors. They are very dedicated professional beauticians. I would highly recommend this course at Eemos to everyone who wants to become a professional beauticians. I am Shanthi Priya n I have trained from Eemos for 3months. It was an awesome experience n here we have friendly Trainee’s . The Management was really Superb. I was a post graduate from a prestigious institution now I’m married n I live in California I am on my h4 Visa so I am not allowed to work. But my love n passion for beauty was their throughout so I decided to do a course in my free time that’s when I heard Eemos salon and spa are starting their academy I knew them from my bridal makeup which was up to the mark. And so I finally decided to join.. I had no clue about cosmetology until I met my teacher’s Mrs. Mohana. That’s were I learnt that beauty is not just what we look at but beauty begins from inside your body..They gave a good start for my carrier and this gave me a motivation to take a next step i am now planning to join cidesco and continue my journey.. I have completed my high school and couldn’t continue my studies. I had to choose a right path to make my future better. My neighbors suggested me eemos academy. I’ve been trained with good theory and practical work at eemos. Mohanalakshmi madam has given us confidence to stay independent. I’ve completed my intermediate education. Because of my financial crisis I decided to work hard and be independent. My aunty suggested me eemos academy. I got a very good training and madam clarified all my doubts and queries patiently. Now I’m very confident about myself. Thanks to eemos madam for her effort in training me so well. Very happy about EEMOS . It is a homely place and providing very good beauty courses and services with convenient prices. Excited to see EEMOS products in the market of beauty and hair. I can confidently say that the products are going to be Awesome. Eemos is a Ladies beauty parlour and beautician training academy in Tirupati. We offer facial services, bridal makeup services, hair straightening services and body waxing services. We also provide beauty parlour training classes in Tirupati.